When Alice, Summer, and Tiernan were in middle school, they were best friends. They'd spend hours in the Peapod, the old VW van in Alice's backyard, listening to Level3, their favorite band. But when Level3 broke up as they entered high school, so did their friendship. Now it's graduation and Level3 is getting together for a reunion concert 2000 miles away. Alice impulsively buys three tickets, and against all odds the three girls find themselves on a cross-country road trip in the Peapod. Can they repair their fractured friendship and make it to the concert in time? 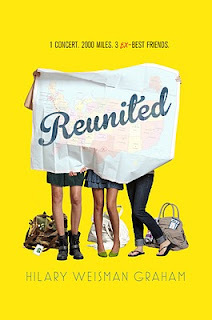 Reunited is the perfect combination of fun, friendship, drama, and love. Hilary Weisman Graham's voice is fresh, funny, and very engaging. The story is told from each girl's perspective, and though each are unique and different, they flow together very well and their characterization is well-done. The secondary characters also are very vivid, from boyfriends to crushes to creepy encounters along the road. Though the girls are constantly moving across the country, the Peapod is a great setting for their travels--quirky and fun with a lot of great history and the cause of a few bumps along the road. While there is some romance, this book focuses mainly on the friendship between the three girls. There is a plenty of drama and a lot of issues to work through, but it doesn't feel trite. From flashbacks to their middle school years, their present-day awkwardness, and painful memories from when they fell apart, their relationship is explored inside-out. Their adventures on the road are hilarious and their antics a little crazy, but always entertaining and the ending is a little unexpected but perfect in every way. Reunited is full of great characters, great writing, great song lyrics—you will love this book. Cover Comments: What's not to love about this cover? I love how it stands out with the bright yellow, and I think that the map is so clever. It embodies the book well--I only wish that the Peapod had made it on the cover somehow! YAY! I'm so happy you liked the book! I can't wait to buy it myself! The Peapod sounds awesome and I agree, it should have made the cover! A VW Van speaks to a lot of people and would inspire more people to pick it up.